Fikri Jermadi ruminated on Korean films with a sated appetite. The title above could have been better thought out. After all, with search engines the heartbeat of the Internet, many led to this website seeking information on the Tommy Lee Jones’s starrer some years ago would be disappointed. Nevertheless, that’s the first thought that popped into my head as I sat down to write this review after a late night nasi goreng. It’s not the best of approaches, both the title and fried rice at midnight. Having said that, our reviewing process is probably not the most conventional of approaches. For the most part, what we (or I) tend to do is watch films. Some of them we decided to review heretofore the screening, while others are delivered their judgment almost on the fly. In the case of ‘The Admiral’, we had a strong inclination to bring in plenty of things about Benedict Anderson’s idea of the nation being an imagined community. Putting aside the fact that it is one of our favourite theories generally applicable across a range of diaspora, I feel like it fit this story perfectly. After all, what is a nation without its stories? 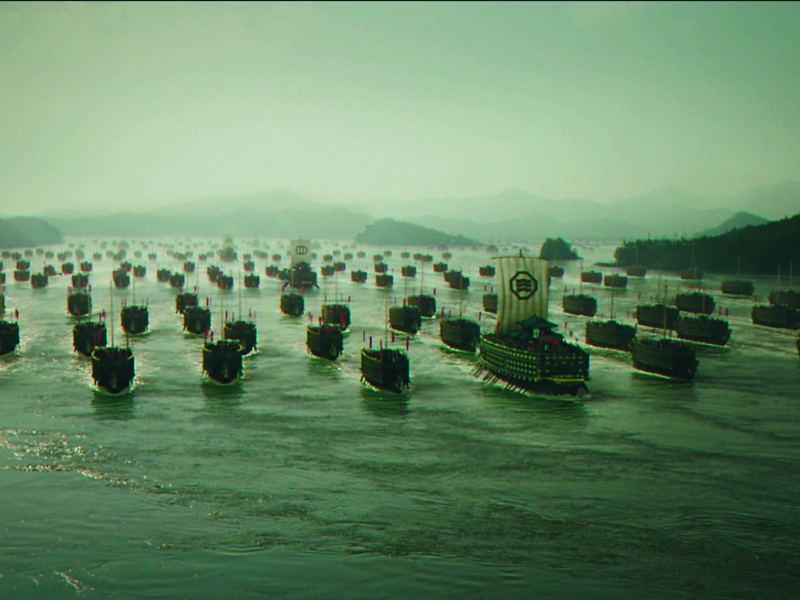 ‘The Admiral’ tells the tale of the Battle of Myeongnyang, which took place in the year 1597. It is an important part of Korean history, regarded by many as the key point that prevented Japanese invasion forces from landing on the peninsular. Given how weak the military was at the time, this would have spelt certain doom for the home nation. 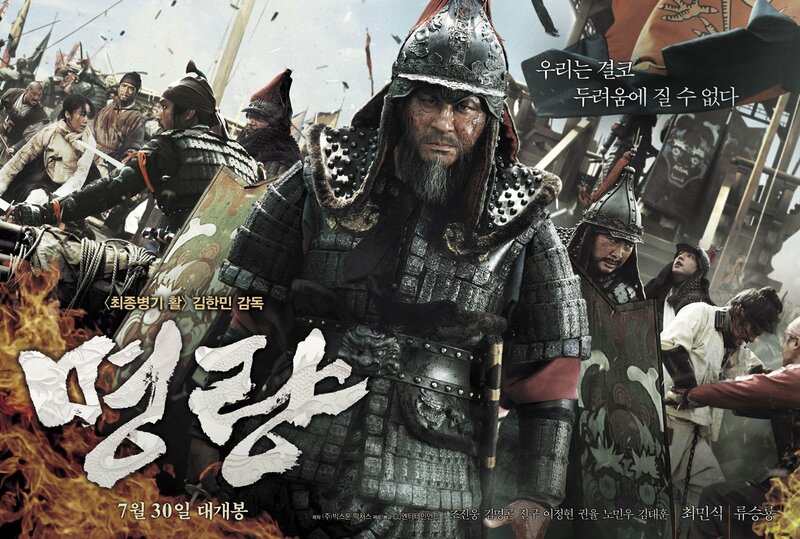 However, their legendary general and man on the poster Yi Sun-sin (Choi Min-sik) did not like that. As such, he went against the grain, ignored the orders of the central government and went ahead to prepare for the said battle. Others seeing the odds of 12 ships against 330 might well have cut their losses, but this is a man with a plan. Even his fellow countryman might have underestimated him, but the fact remains that he is also their last hope for victory under such circumstances. 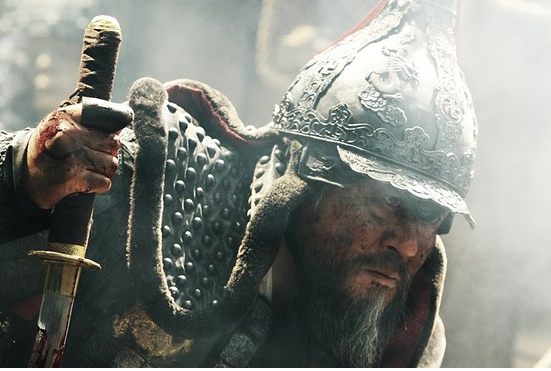 You have, therefore, a film made for nationalistic purposes, with release dates that coincide with days of great historical and emotional significance, featuring characters who define many people’s understanding of history performed by actors of great (inter)national renown (Choi Min-sik, of course, was the old boy in ‘Oldboy’). You can’t really go wrong, can you? It adds further to the canon of films that brings to mind great achievements of the past. You even have the Japanese getting their behinds handed to them; for the uninitiated, it’s the regional equivalent of other political uprisings engineered by the colonised against their colonisers. Take your pick from the Indian uprisings against the British, Indonesia’s struggle for independence and America’s great wars (both civil or otherwise), among (too many) other examples. Anti-Japanese sentiments are not quite as fervent as they used to be, but it would also be equally wrong to say that they don’t exist at all in the current national imaginary. From a storytelling perspective, too, there’s much to like about the film. Rarely seen in such historical epics (at least the ones I’ve seen) is the utilisation of non-linear elements. Earlier scenes would show Yi Sun-sin being questioned by his younger charges, with a particular conversation being incredibly important for its highlighting of the admiral’s greater plan. Remember, this is a man on the down and out, given the third degrees and Spanish inquisitions (figurative, of course) by all quarters. However, the answers to these questions would only be revealed as the story progresses. What we therefore get later in the film is the answer to the questions raised probably an hour ago. In addition to creating little pools of silence in a sea of chaotic action scenes, the enlightenment is therefore both emotional and intellectual at the same time. I can definitely appreciate that. It’s great to see a fantastic story visualised in an epic manner, one befitting of the grand scale of the admiral’s achievements. I don’t recall many historical epics that have utilised flashbacks in such a manner. These were the thoughts that floated around in my head before I wrote the review. As I fired up my laptop with a full belly, though, one word came into being: the Western. While the naval heroics doubtlessly feed further into the so-called national image and imagination, it is also interested to note that such Eastern ideals are upheld by way of a genre regarded literally and uniquely Western in nature. That particularly dichotomy, of course, is not fixed, for the world works not in the binaries of black and white constructed by non-native perspectives (at least it shouldn’t). Rather, ours should be a rainbow, a cornucopia of colours and shades that highlights the differences in attractive ways. This is not as evident in ‘The Admiral’, but then again, expressions of nationalism is rarely that accurate anyways. What the film does, though, is to further affirm the East by way of the West. Does it make this film somewhat post-Western or post-colonial in nature as well? Perhaps, perhaps not. One thing for sure, though, is that what we know of Korea as a country would certainly not be the same without him. 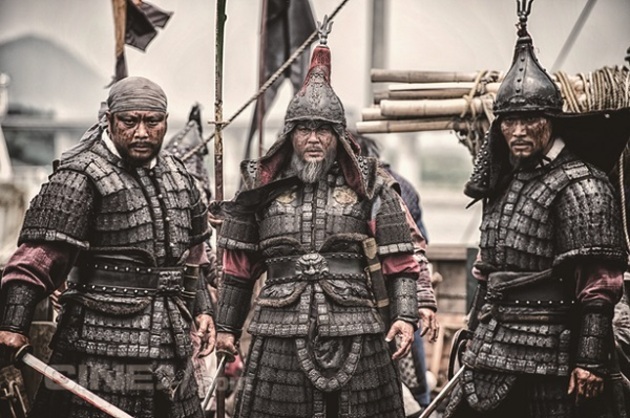 Having seen Choi Min-sik in ‘Chihwaseon’ and ‘The Tiger’, I feel like he is quickly establishing himself as one of, if not the go-to guy for historical figures in period dramas. At least Ahn Sung-ki will not be alone in that regard in this country for old men. Fikri is downing bottles of water now, having bitten some chili padi.